This ancient system is meant to explore the dimensions of meditation—from body, to breathing, to mind. At the level of the physical self, it will help you find a quiet stillness within. At the level of the breath, it will lead to an uncoupling from the tensions and negativity of daily life. At the level of mind, it will help you to learn to rest in a quiet center of being for the nervous system and the brain to benefit for long term. Beginners and seasoned students welcome. 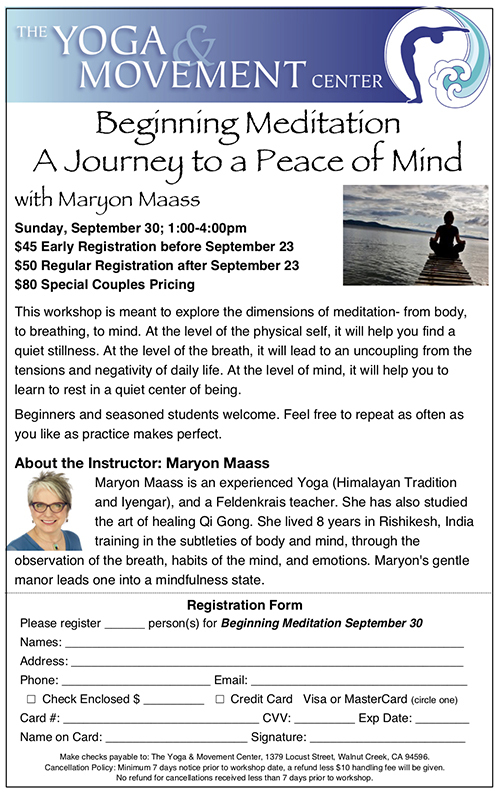 Maryon Maass ERYT-500 is an experienced hatha yoga and meditation teacher. 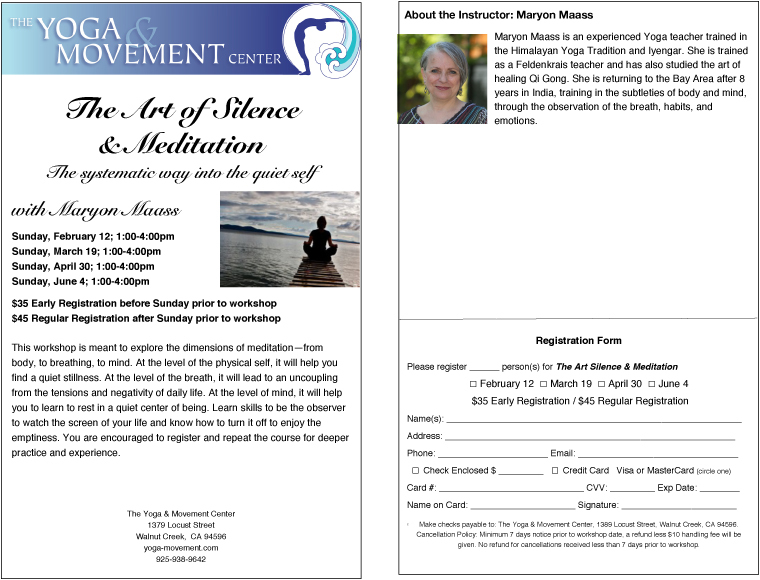 She is trained in the Iyengar and Himalayan Yoga Tradition, Feldenkrais Method, Qi Gong, and Restorative Yoga and lived in an ashram for 8 years in India. 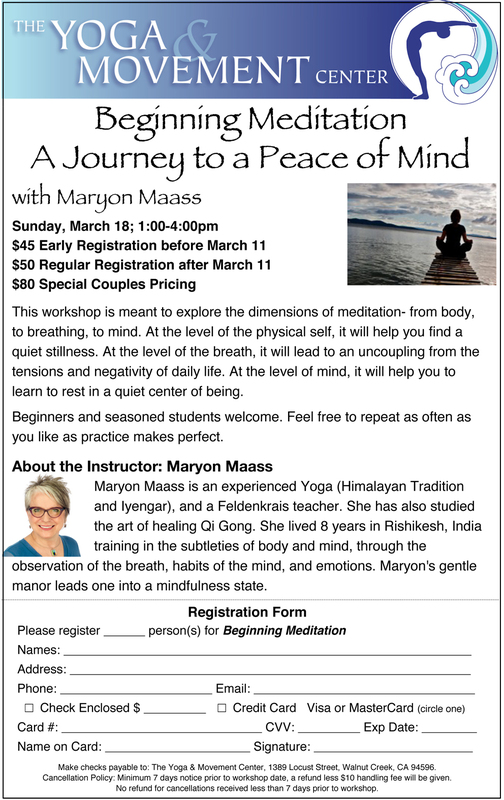 Her teaching style allows one to feel the deeper more peaceful effects of resting in stillness. body, to breathing, to mind. At the level of the physical self, it will help you find a quiet stillness. At the level of the breath, it will lead to an uncoupling from the tensions and negativity of daily life. At the level of mind, it will help you to learn to rest in a quiet center of being. Learn skills to be the observer to watch the screen of your life and know how to turn it off to enjoy the emptiness. You are encouraged to register and repeat the course for deeper practice and experience. Kaiser has a regular monthly meeting for stroke patients. Last week (July 27) I presented a class for members and their caretakers. I explained what yoga is, and how practicing the “art of yoga” can effectively help with many physical and cognitive issues. I covered topics, such as the use of the breath, and how the nostrils are a way to understand the relationship of the breath to the brain, then the mind, and the emotions. This understanding can make huge differences in ones energy levels. Also covered the simplest of exercises called joints and glands. These movements were possible for each of the participants who were there, whether they were able to stand or sit. We used visualizations for those who were not able to physically move. The participants and the social worker felt that the class was very useful and they had very practical experiences to take with them to use on a daily basis. 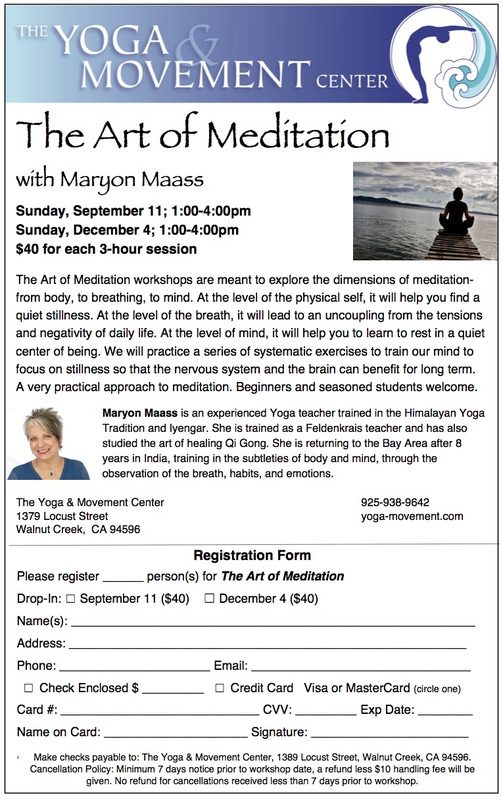 The Art of Meditation workshops are meant to explore the dimensions of meditation- from body, to breathing, to mind. At the level of the physical self, it will help you find a quiet stillness. At the level of the breath, it will lead to an uncoupling from the tensions and negativity of daily life. At the level of mind, it will help you to learn to rest in a quiet center of being. We will practice a series of systematic exercises to train our mind to focus on stillness so that the nervous system and the brain can benefit for long term. A very practical approach to meditation. Beginners and seasoned students welcome.